Like all boys, Ne Zha was born from his mother's womb. That, however, is where Nezha's similarity to most boys ends. While not known to many in the West, for Chinese, Ne Zha has been a household name for centuries. He appears in everything from mythology to techno dances, popular movies to classical novels such as Investiture of the Gods and Journey to the West. According to legend, it all began 3,000-4,000 years ago, during the Shang Dynasty in northeastern China. A military commander, Li Jing, anxiously awaited the birth of his third child. And he was anxious for good reason—his wife’s pregnancy had lasted three years and six months. The next day, Lady Yin gave birth to a large, round ball of flesh—basically a meatball. Shocked and disappointed, her husband suspected the anomaly to be demonic and drew his sword. He proceeded to strike the fleshy mass, piecing the surface and revealing, to his amazement, a grown, vivacious child—Ne Zha. Shortly after, a Daoist immortal arrived and offered to take the boy as his disciple. Both parents consented, with the Daoist then bestowing Ne Zha with a magic instrument—the Cosmic Wheel (qian kun lun). The extent of Ne Zha’s extraordinary powers would soon be revealed. One hot day, Ne Zha, eager to cool off, went bathing in a nearby sea. Still unaware of the power that his magical instrument possessed, he took his Cosmic Wheel—the shape of a medium hula-hoop but heavier than any mortal could lift—and swished it around, only to end up causing massive tremors deep in the water below. 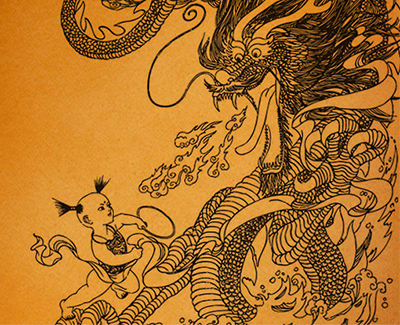 The tremors caused by Ne Zha shook the underwater palace of the Dragon King of the East Sea. The enraged Dragon King ordered one of his scouts to find out who or what was causing the chaos. Upon discovering Ne Zha, a mere boy, to be the culprit of the seaside antics, the scout expected to kill him with ease. With one blow of his Cosmic Wheel, though, Ne Zha killed the scout. Learning of this, the Dragon King sent his favorite son to deal with Ne Zha. Ne Zha killed him as well. Overcome with rage, the Dragon King vowed to report Ne Zha’s crimes to the Jade Emperor—supreme ruler of the heavens and mortal realms. Ne Zha, however, dashed to the gates of the Jade Emperor’s palace and arrived there before the Dragon King. Using invisibility charms, he caught the Dragon King by surprise and served him a round of blows before he could see the Jade Emperor. Perhaps what has made Ne Zha so endearing, his unlikely powers aside, is the ebullient, playful persona of this age-defying folk hero. Ultimately Ne Zha, and figures like him, invite us to partake in a world of wonder, a world where the horizons of human possibility are stretched, always for the better.